Someone somewhere is currently penning an editorial called ‘The Rise And Rise Of Rise Records’, and it will be a good read. For a label that’s seemingly come out of nowhere they now hold a number of trump cards within the metalcore scene, not to mention their recent branching out, which has seen them sign bands like Man Overboard and Sharks. However, it is metalcore which provides the majority of the success for the label, and The Color Morale, are one of their lesser known acts. How long it stays like this is largely down to how long it takes for sophomore record ‘My Devil In Your Eyes’ to explode. ‘My Devil In Your Eyes’ is a marked improvement from the Illinois five-piece, in comparison to debut ‘We All Have Demons’. Gone is the filler and metalcore by numbers, to be replaced by something more complex, something better. Sure the standard staples of metalcore are still there; clean vs rough vocals; beatdowns; chugging guitars etc; but what The Color Morale achieve with ‘My Devil In Your Eyes’ is mature in its sound. The intensity of ‘My Devil In Your Eyes’ is apparent from the opening roar of first track ‘Nerve Endings’. It’s a full on assault of guitar, bass and drums from the off, with Garret Rapp’s distinct guttural roar bursting through your speakers. It doesn’t take long for Rapp to utilise his clean vocals and impart some melody on proceedings. It’s worth noting that Rapp, like Jeremy McKinnon, should be praised for his ability to switch between note-perfect clean vocals and a thundering roar at the drop of a hat. When Rapp sings he is capable of hitting the same range of notes as label-mate Johnny Craig, and the intensity of his roar is just as impressive, the contrast proving particularly effective on tracks like ‘Walkers’ and ‘Falling Awake’, songs which are full of equal measure rage and beauty. In both lyrics and structure the band has come on leaps and bounds. On a number of tracks the band tend to steer clear of traditional song structures, constructing chorus like parts and placing them at the end of a song or forgoing choruses altogether. Whereas with some a disregard for structure causes a feeling of sloppiness, with The Color Morale it feels right, and further to this they are able to still be catchy through effective manipulation of the rhythm and lyrics. ‘Human(s)Being’ is a prime example of the band placing their chorus-like section at the end of the song, while the schizophrenically awesome ‘Demon Teeth’ is the band ditching anything remotely like a chorus. The band veers between Underoath and Norma Jean throughout, but are able to maintain their own sound. ‘My Devil In Your Eyes’ is the sound of a sleeping beast awaking. 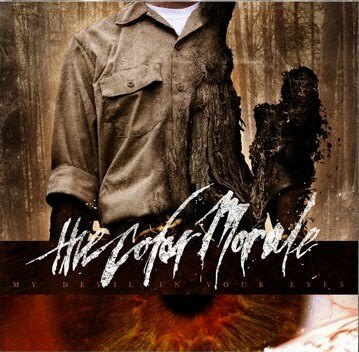 You may not of heard of The Color Morale before, but that is sure to change with the advent of this album. If metalcore is your thing this album is a must, and if you happen to be one of genre’s leading lights, watch your back, because The Color Morale are coming. ‘My Devil In Your Eyes’ by The Color Morale is available now through Rise Records. The Color Morale on Facebook, Twitter and MySpace.